8: Law and CE - Should I Sign and Stamp These Plans? 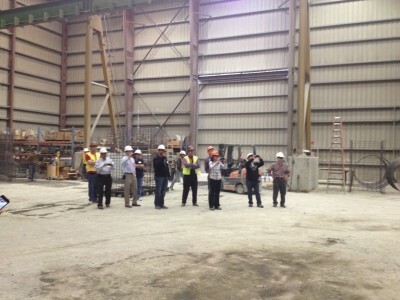 We couldn’t have asked for better weather on March 22nd when a group of about forty ASCE OC Branch members boarded a chartered bus to take us from Tustin to Rialto Concrete Products (RCP) on a “behind-the-scenes” engineering tour of their manufacturing plant. Our March field trip was in lieu of our normal luncheon program and offered an up-close opportunity to observe how some of the most widely used products in our industry are manufactured. 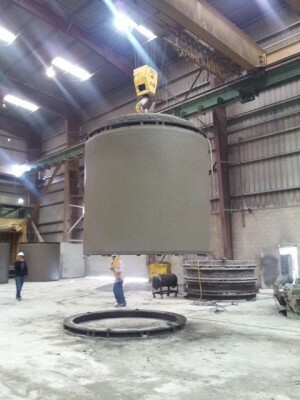 RCP manufacturers reinforced concrete pipe and precast and cast-in-place manholes and structures. They are one of the largest suppliers of concrete products in the Southern California area and also have plants located in Texas. Their Southern California facility, which is located in the City of Rialto, was impressive not just in its size with acres upon acres of concrete products stacked in its yard as far as the eye could see, but also in its operational efficiency, state-of-the-art equipment and knowledgeable staff. We were greeted by the RCP management staff as we got off the bus and it was clear from the get go how passionate these gentlemen were about their company and the products they produce. Our group got a chuckle from the not-so-subtle sticker on one of RCP’s manager’s hard hats, telling us exactly how he felt about a competitor’s product! 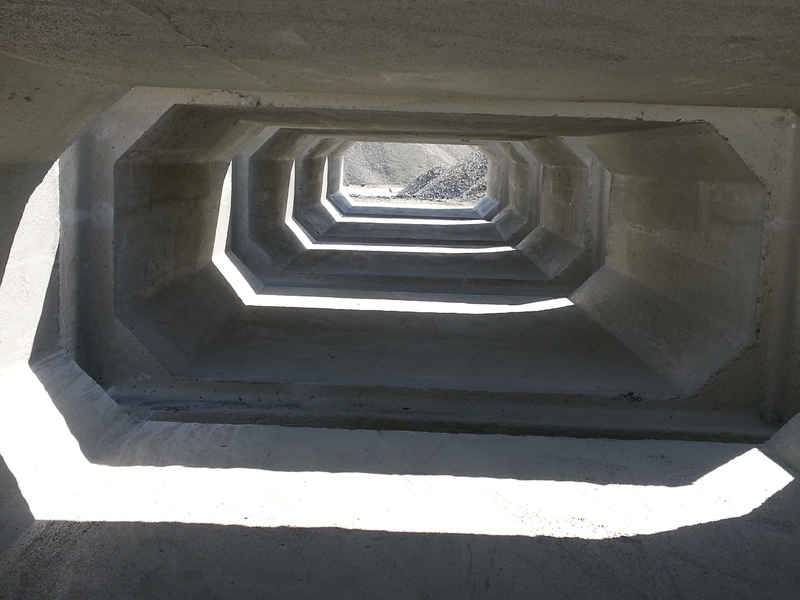 Our tour began in the yard where over a hundred precast monolithic reinforced concrete box culverts were curing. Our tour guide described the manufacturing process, different standards they routinely design to (such as Caltrans and Greenbook) and pointed out design features such as client-specified knock-outs, steel lifting lugs, top slab, bottom slab, and wall thickness requirements, and haunches. With earplugs firmly in place, we were escorted into the manufacturing plant, where we observed the manufacture of several of these box culverts. We all watched as a steel cage designed for a 6’ x 3’ box culvert was lifted high above our heads using a 17-ton crane and deposited gently into a pit where the concrete formwork was then overlaid around the cage. Staff worked quickly to direct the concrete into the formwork which was compressed around the steel cage. Within a few minutes, the form, steel cage, and concrete were lifted as a single unit from the pit and gently deposited back where the bare steel cage originally sat. After the assembly had been secured, the crane was used to remove the form, revealing a perfectly shaped reinforced concrete box! 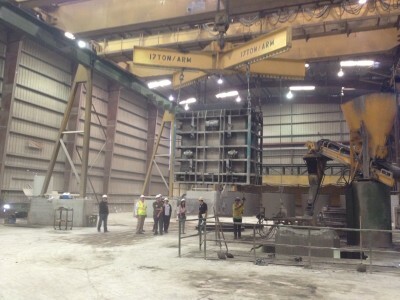 From start to finish, it took about 15 minutes to produce one of these structures, a very impressive operation! Immediately adjacent to where the box culverts were being formed, large-diameter reinforced concrete pipe was also being produced, using an almost identical process as the box culverts. 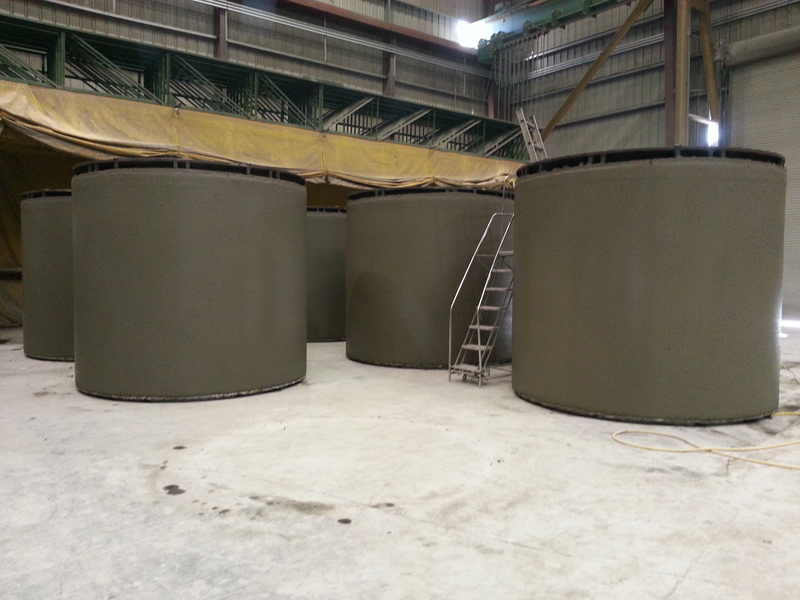 Within less than a half hour, at least four new large reinforced concrete pipe segments were manufactured before our eyes. Our tour guides then led us to an adjacent room where smaller-diameter (24-inches and smaller) reinforced concrete pipe was being produced. Just five weeks before our visit, RCP had installed a state-of-the-art automatic welding machine which welds the pipe steel reinforcing cage in a fraction of the time required using conventional welding methods. Our group got a real surprise when the Egan system was fired up. 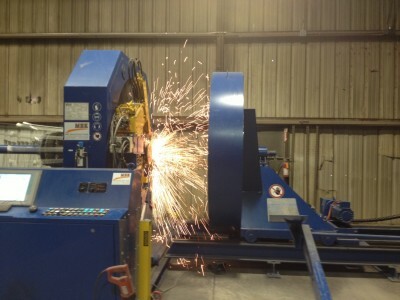 A worker had inserted pre-cut steel rods into the machine, and then the machine took over! In a blaze of sparks that looked like an indoor fireworks show, the Egan machine automatically wrapped steel wire around the rods and welded the entire cage in under 15 seconds! Its final task was to cut the steel wire, freeing the steel cage and allowing the worker to move it and start the process all over again. 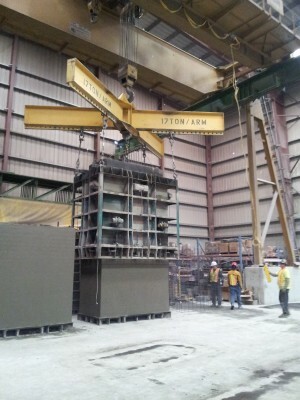 Once the steel reinforcement had been welded, the cage was moved to another room where yet another machine, this time one of the oldest machines in the plant (over 30 years in service) was being used to place the concrete around the steel. Opposing rotating devices on the inside and outside of the pipe would evenly distribute the concrete around the steel cage, producing a perfectly shaped stick of concrete pipe. 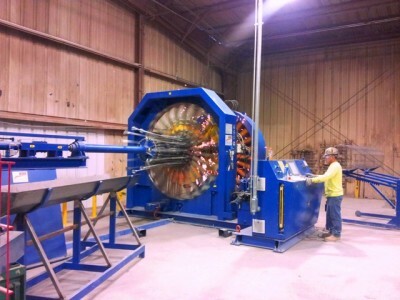 Our guide indicated that one of these machines can produce over four hundred pipe segments in a single day. After the impressive tour of RCP’s plant, we were treated with a delicious BBQ luncheon, complete with tri tip, chicken, BBQ beans, cole slaw, and buttered rolls. While we ate, RCP staff gave a Power Point presentation on several products their parent company, KTI Pipe Group, manufacture including concrete and reinforced polymer tunnel segments, single pass pressure pipe for water and sewer applications, and flowtite jacking pipe. All in all, it was a very rewarding way to spend a Friday. Our thanks go out to RCP and their staff for hosting us and providing us with a memorable experience!